When looking for a worktop, we all need the same things. Durability, hygiene, and function. We all want our homes to look attractive. But unlike our little list of ‘needs’, there’s no one work surface everyone will find attractive. Or is there? Let us introduce you to Corian kitchen worktops from DuPont. Who are DuPont and why are they important? DuPont is the company which made the modern work surface a reality. For over 200 years, they’ve been innovating and inventing to create solutions for the home, and ranges that are extensive and affordable. Even now, DuPont is making discoveries into modern materials and manufacturing methods, all of which allowed them to create Corian. Since its creation in 1967, Corian’s popularity has grown. Known for its robust yet attractive finish, Corian was created to be part of your home, and whatever you create there. Resilient enough to stand up to modern life, and with colours so deep it’ll always look fantastic, there’s no secret as to why Corian made DuPont a household name. What aesthetic features do Corian worktops have? If you take a look at DuPont’s website, you’ll notice they’re not a kitchen worktop manufacturer – or rather, they’re not just a worktop manufacturer. At DuPont, they understand the science of resins, polymers and plastics, and how they can be used to create modern materials. Corian kitchen worktops come in a range of superb colours to match your kitchen decor. All this knowledge has been put into the creation of Corian, to make it a practical surface, and a great alternative to the other quartz, granite and stone-effect worktops. Corian is ‘solid surface’ which means there’s no hidden fillers or MDF in their worktop. The materials, resin and colour is evenly distributed throughout the worktop, meaning it can be cut, sanded and shaped without the need for end stops, or strips of laminate. These features of solid surface worktops are making them the must-have choice for kitchens across the country. Corian has a lot of choice to offer its customers. While most of the colours available are stone-effect, their Urban Freedom range includes twelve vibrant solid colours, to redefine what a modern kitchen looks like. 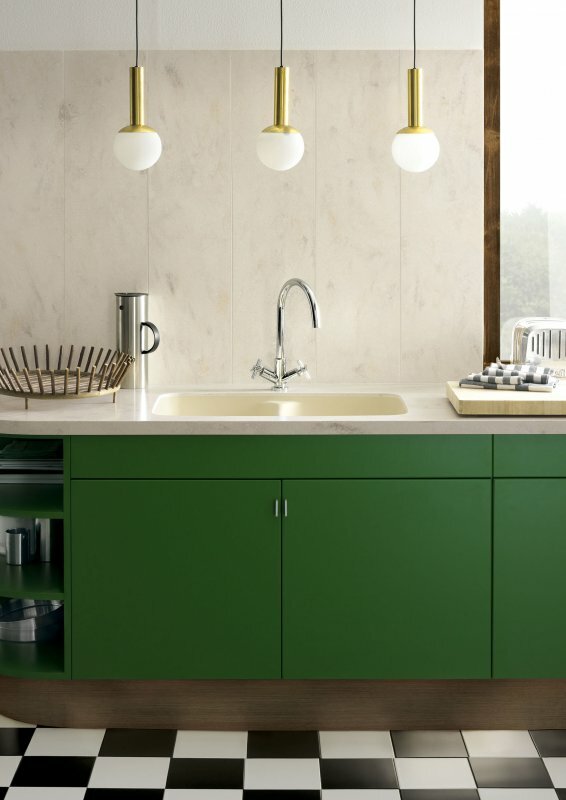 With Corian, you can have a bright burst of colour with a more refined finish than laminate. Finally, kitchens don’t have to look rustic, metallic or stone-y. It’s your time to decide what a kitchen should really look like. What size Corian worktops are available? Corian worktops are manufactured at 38mm, a little slimmer than the average work surface. But this is the only dimension of your worktop you can’t choose! To ensure a perfect fit, Corian worktops are made-to-measure, which means you’ll need to give us your sizes. Get out those tape measures and start taking notes! We’ll need to know where you want your hob and sink, and then we can work together to place those pesky edges and joins in the right places. Unfortunately, we have to insist on this stage, so that we can give you an accurate quote, and the only surprise you’ll have is how good your kitchen looks. If you’re a skilled do-it-yourself-er, let us know. While our service includes quotes, templates and installation, we do offer a delivery-only service if you’d like to do this yourself. While the bold colours and textures of the Corian surfaces are on-trend right now, we appreciate that slimline surfaces are too. Stronger, thinner surfaces are taking the show rooms by storm, and we understand if you’d like to keep your options open–which is why we also sell Apollo’s Slab Tech range. This is a series of 20mm stone-effect worktops, perfect for a sleek, minimalist look. But if that’s just not thin enough, we also carry Apollo’s ultra-slimline surfaces. At 15mm thick, these surfaces are also ultra-strong, and can stand up to the challenge of looking great and staying stable. What accessories can you get with your Corian worktop? Corian is the most customisable surface we’ve seen, letting you create a home that’s as unique as you are. First, there’s all the features you’d expect from your work surface–like a range of return ends which allow your worktop to fit flush to your kitchen wall, no matter what the shale. Curved, radius, or return, no shape phases DuPont. There’s plenty of choice for your cut outs for sinks and hobs, so that your surface can fit your appliances perfectly. But DuPont doesn’t stop there. Unlike other manufacturers, DuPont also offer a range of sinks made from either stainless steel, or Corian – the same material used to create your worktop, in colour choices of Bone, Cameo White, Glacier White and Vanilla. Bring your kitchen to life with a Corian worktop. We still haven’t reached the end of Corian’s customisable details. The finished edge of the worktop can be altered too. Thanks to its solid surface, experienced craftsmen can add a range of different shapes to your worktop. You might choose to have the edge curve around the countertop, or try a raised ‘waterfall’ edge to prevent spills getting out of hand. This added little luxury edge could be the finishing touch you need to define your space. What colours are available with Corian? While we love the bright bold colours of Urban Freedom, and they are very popular right now, we wouldn’t be doing our jobs if we didn’t tell you what our other customers are choosing. One trend we’ve been seeing is that pale colours (like white and grey) have been taking centre stage. We’re not surprised, as these colours can give your kitchen a clean, natural look, and increase the appearance of light. It just goes to show that customers are looking for choices beyond classic stone and wood effects, and we’re happy to show off our variety. What are the benefits of choosing Corian? Long history aside, DuPont’s products are popular because they have the know how to make the visions of their customers come true. They have a huge range of colours, and have been adding more to their ranges. As a combination of resin and natural minerals, evenly distributed with various pigments, Corian benefits from the features of many acrylic surfaces, as it’s the perfect material to resist spills and scratches. Unlike other materials though, Corian can be formed with heat around moulds to create 3D designs–which is why it’s possible with Corian for your sink to match your counter top. Thanks to the non-porous resin these worktops are made from, they’re hygienic, and perfect for domestic use. Corian has also been known for its use in hospitals, laboratories, shopping centres and hotels as it doesn’t allow bacteria to make its home there. Not even in the joins, as thanks to the made-to-measure service, any joins can be made to be practically invisible with careful sanding and polishing. We hope you’ll consider these benefits carefully, and that you’re thinking about choosing Corian if you’re looking for solid surface worktop that makes a statement. Why not browse our range of Corian worktops today?